There were two more media stories from this past week that brought attention to teens killing teens on the South Side. The second story was a triple homicide in the South Chicago neighborhood. 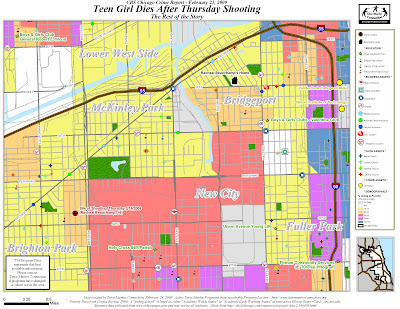 Johnny Edwards, 13, Raheem "Chiko" Washington, 15, and Kendrick Pitts, 17 were each shot near 87th and Exchange. 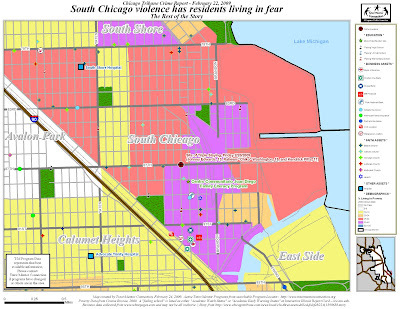 One local resident, quoted in the Tribune article, dubbed the high-poverty, high-crime South Chicago neighborhood "Death Row" because "someone's always getting shot." Another mother added that, "Area gang members just don't care ... They shoot everybody and anybody." Last week, I wrote a "Rest of the Story" blog that looked at the murder of Johnel Ford, a story the media reported as "the first CPS student killed in 2009." In that blog, I asked a few questions that I feel apply to this week's stories as well. When looking at the maps above, I hope community and program leaders continue to ask , "What are we doing to support existing tutoring and mentoring services? And how can we get our message to concerned parents who want safe places for their children to hone scholastic and vocational skills?" I hope community leaders continue to use my maps to visualize problems and to locate available resources, combining strategies from the Tutor/Mentor Institute to address these questions. Look - I know what you're thinking. "The problem is bigger than tutoring and mentoring. This violence is out of control. This situation is hopeless!" Ok - first of all I should say, that we at the Tutor/Mentor Connection do not claim that a few new programs are going to be an overnight fix to 16 year old girls riding with gangbangers on a Thursday night in Brighton Park. Or to the street violence in South Chicago. But ONE program in the entire South Chicago neighborhood? Come on! We can do more to help the kids who aren't gangbanging and who are looking for help to lead productive lives. What we want is for everyday people (like you and me) to do whatever they can to support existing and new program alternatives for these kids. We ultimately need community, business, spiritual, and political leadership to start thinking more consistently about how they can invest in the talented students who are trapped in seas of poverty, violence, and fear. But first, leaders have to become aware of the programs and their successes. Who better to raise widespread awareness than far-reaching media outlets like the Chicago Tribune? It would be so helpful if the media could consistently champion the successes of tutoring and mentoring as potential solutions to the problems of urban violence and fear. Ok, I'm kidding, and I certainly don't mean to be disrespectful to the papers, the journalists, or the shoppers... I just want to be constructively critical for a minute here. The point is that over and over, the media seems to simply cut and paste new "gangbanger" names into dutifully-rehashed article templates, adding 1 to the "CPS Students Killed" ticker, and then losing focus... leaving us with an impression of hopelessness... little new awareness... little or no discussion of things we can do to relieve the situation moving forward. "I can create all of this, but if no one looks at it, I'm a crowd of one. It's up to you in the media to connect your stories to information that people can use to learn more about the problem and to get involved in the solutions. If you do this once a week for the next ten years, maybe others will follow your example and they will help us put more programs in these areas to help parents, and compete with gangs, for the attention of kids." So again, can the programs solve the city's teen violence problems overnight? Probably not. The programs can however offer a message of hope now. Hope for beleaguered parents and students in high-crime areas, when they learn that peers and neighbors have succeeded in bypassing the violence, and have gone on to achieve scholastic and vocational success. with the potential for big successes for society later. The Chicago Tribune and Sun-Times each ran stories last week that brought attention to the "1st CPS student killed in 2009." The Tribune has since pulled its article from its archives, but the Sun-Times story still exists as of this posting. Young man or girl with big dreams, shot by another teenager. 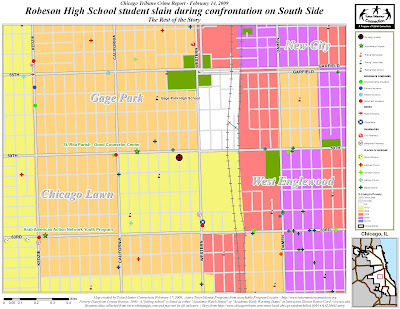 Often the student is living in high-poverty areas of the South or West Sides. Often, the media proposes ties to gangs (which the family often denies in the article.) And almost always, they make a point of telling us that he/she is a student at a Chicago Public School. It's been sort of trivalized - like a game: Counting and posting the number of 'CPS Students Killed' ... versus simply reporting "Teen with high potential shot" or something more human. But I digress. ...That 16 year old Johnel Ford was shot in the head about 4:30 p.m. on February 12, 2009. It occured on the 5900 block of S. Campbell. And that he was "a 'funny, smart, intelligent' kid who had a natural mechanical ability, ... and wanted to go to college." But he had made some "enemies" lately. The Tribune article (that, again, wasn't archived for some reason) added that Johnel had run into trouble at Gage Park High School (near his home and the sight of the shooting) and had recently transfered to Robeson. This Trib article reported that another group of young men opened fire when confronted by Johnel's cousin for unknown reasons. The bullet missed the cousin and hit the unintended victim, Johnel, who was in the wrong place at the wrong time. Johnel could have been in a tutor/mentor program at 4:30pm on a Thursday afternoon instead of on the street, perhaps receiving guidance from an adult mentor... working toward his college dreams. What if an article actually mentioned this? What if the Sun-Times showed a map that told the "rest of the story," and explored potential tutoring-/mentoring-based solutions? Perhaps if people saw this map, and a reporter initiated a discussion of tutor-/mentor-related solutions, people would start asking questions! For starters, what are those two tutor/mentor programs doing in the neighborhood to promote their service to students like Johnel? Did he even know they were available for him? Maybe they offer a safe place to get tutoring, work on computers, talk about life with adult mentors, or simply meet and befriend other college-bound peers at 4:30pm on a Thursday? And really, how extensive are the services the programs offer? How could Johnel learn about them? Lawyers Lend-A-Hand lists the programs on their master list but doesn't necessarily support them, and it becomes even less clear to me how "quality" these programs are when I try to check out their websites. Unfortunately one program doesn't even have a website that could give Johnel info about its services. The other one gives an indication on its site that they are active and offer one-to-one volunteer-to-student mentoring, but doesn't give as much detail as a great site like, say, East Village Youth Program about what the program offers a kid like Johnel . With this said, I am making an educated guess that these programs (like all programs that rely on volunteer/part-time help, and operate on shoe-string budgets) can use help getting the word out to the kids on the streets, and to potential volunteer tutor/mentors. What are business leaders doing in the neighborhood to support these two existing programs? As we've seen in other blogs, the mass-market retailers, banks, and insurance companies here (in concert with other businesses that aren't mapped) can use strategies on the Tutor/Mentor Institute to collaborate efforts and build alliances that recruit volunteers, pool money, and post program info for the community to see. And of perhaps greater importance, who is working to add NEW program options for the students living here? Commonly, programs have a maximum capacity of up to 75 students. 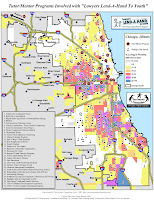 Assuming these two programs are operating at this capacity (and knowing that there are far more than 150 students living in this area), it's easy to determine that this is a region in Chicago that has an urgent need for new quality mixed tutoring/mentoring programs. Spirtual leaders can help here, perhaps opening their doors to host new programs. They can also help by preaching the benefits of tutoring and mentoring to their congregations, raising awareness for students and parents, while simultaneously creating enthusiam and promoting sense of community. The Tutor/Mentor Institute has a document that deals with this specifically, called "How Faith Communities Can Lead Volunteer Mobilization For Tutor/Mentor Programs." Oh, and state and federal politicians who serve this area's constituents can request custom maps like the one I created for the 5th Illinois Legislative District, to use in conjunction with strategic documents from the Tutor/Mentor Institute, in order to facilitate/lead the entire support/creation process. Call me optimistic, but it's my feeling that we can find a way to reach more underachieving students who are currently living in high-stress situations... students who have dreams that perhaps seem inaccessible... get them off the streets... and give them the direction they need to get to college, become responsible adults, and contribute to the revitalization of our communities. We can work together to provide the tutoring and mentoring support that can save the life of a Johnel Ford, and groom his talents for the improvement of society as a whole. On Wednesday, December 17, 2008, the Sun-Times Judge Marovitz Lawyers Lend-A-Hand to Youth Program (LAH) awarded $217,000 in grants to 27 "exemplary" tutor/mentor programs in the Chicago area. These programs qualified for these grants by maintaining a high ratio of volunteer-to-student one-on-one mentoring. LAH points out on their website that "the money will benefit over 2,500 Chicago-area young people." On his blog, Dan Bassill explains the importance of this funding to the operations of non profits that won the awards... programs like his Cabrini Connections and Tutor/Mentor Connection organizations. ... and compare it to this year's map (the big one above), you see that many of the same programs met LAH qualifications both years, and received grants both years. This sort of collaboration, among professionals in the same industry, represents a solution to one of the greatest challenges to non profit tutor/mentor programs: Securing the continued, consistent, and reliable funding needed to provide the continued, consistent, and reliable tutoring/mentoring "high-risk" students need. 27 programs is far fewer than the 200+ programs that exist in Tutor/Mentor Connection's searchable online program locator database. The map below/right shows all known "tutor-only," "mentor-only," and "mixed tutor-mentor" programs in the program locator database. What does this mean? Well, my first question is, are there more programs out there, in addition to all the ones we know about (plotted on this map)? If so, they should "get the word out" about their program, and let the tutor/mentor community know what they are doing locally. I mean if a collaboration like LAH - one that is itching to give out donor money - doesn't know about the work a program is doing, that program would obviously not be receiving money from a potential income source. A great place to start raising visibility would be the program locator. If you're out there doing tutor/mentor work, and not coming up in search, please add your program's information today. My second question is, are there programs in the program locator whose data is currently incomplete or inaccurate? This would be unfortunate for several reasons. Ignoring for a moment the fact that parents and students would be misguided by outdated or incomplete data when shopping at the program locator for a tutor/mentor service, there might be situations where programs are losing opportunities for funding as well. For instance, if a search of the program locator returns a record for a program, and shows it as "tutor-only"... but this program is actually doing mentoring work as well... this is another situation where failing to report and maintain program locator data could lead to missing a funding opportunity. In short, I guess what I'm trying to say is that programs need to regularly visit and maintain their program locator data to ensure it is up to date. Ok, but what about the programs that ARE in the program locator and ARE meeting the "exemplary" tutoring and mentoring standards a collaboration like LAH rewards? The map to the left shows that there are far more than 27 programs doing mixed tutor/mentor work. An alliance like LAH has only so much money to give. Are there other networks (Lawyers LAH obviously represents the legal industry) that can forge alliances that help fund tutoring and mentoring programs? Perhaps medical or spiritual groups (quick examples among dozens of possibilities)... or better yet, any professionally affiliated networks with common interest in the common good, can bond together as LAH has done, to raise awareness within their networks to the importance of mentoring disadvantaged youth... to help recruit volunteers to serve as mentors, to encourage members to serve on boards and donate management expertise to programs... and of course to generate funding for continued non profit tutor/mentor operations. Strength in numbers. How can we encourage community and political leadership to come together and work with the assets and resources in their neighborhoods to support existing high-quality programs, and to develop new ones where there is a need and none exist? 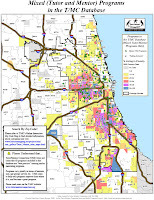 We can't forget, as we look at that last map above (the one that shows all programs known to be doing mixed tutor/mentor work), that there are huge pockets in Chicago that are packed with poverty and "failing" schools... areas "in need" that have limited or no tutoring/mentoring support for its students during non-school hours. 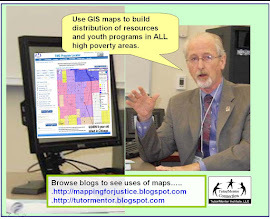 This blog continues to encourage community leadership to use my maps and the strategies at the Tutor/Mentor Institute, as starting points to generate logistical and financial support for programs in their community. Please use the quick links at the right side of this website to find blogs I have written that focus on your industry, interest, or area of professional expertise. And then please got involved! My maps try to expose spatial relationships among community resources, with the hope that political leaders can use the maps and exposed relationships as tools to encourage and motivate collaboration... putting minds together to forge strategies that improve communities through improved support for tutoring and mentoring. However, the office for Tutor/Mentor Connection is not in any of these districts. We share office space with Cabrini Connections, the tutor/mentor program that serves 7th through 12th graders with ties to the Cabrini Green neighborhood. 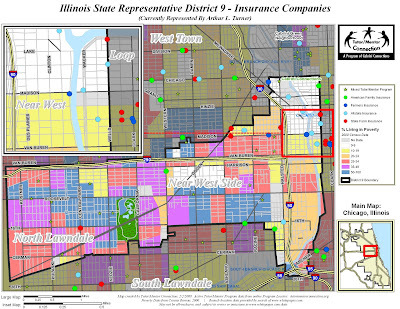 Illinois State Representative District 9 is currently represented by Representative Art Turner. The first map below shows that District 9 contains the whole spectrum of wealth distribution. From the riches of downtown's West Loop commercial district... to the heavily impoverished North Lawndale neighborhood (where Art Turner was born and raised... and currently resides according to his website), commuters who take the Eisenhower, Kennedy, and Dan Ryan Expressways into work each morning are likely to cross through one of the district's panhandles of poverty and converge on the streets of downtown. As we've seen over and over (and the trend continues in the map above), there is a clear and consistent relationship between poverty and the occurrence of "failing" schools (schools that are on the state and federal "watch" and "warning" lists and are at risk of penalty and sanction). This map shows that there are currently 26 "failing schools" in this district's high poverty neighborhoods - schools that are responsible for teaching and guiding thousands of struggling students. In our searchable online database, we know of (and have mapped here) only 18 programs that are currently trying to improve the chances for students to overcome the obstacles of poverty. Do the math. Cabrini Connections works with 70 students. If each of these programs has a capacity of 70 kids (and this is a huge assumption), it becomes a no-brainer that this district needs leadership and strategy-building to accommodate the tutoring and mentoring needs of its students and their overburdened schools. My maps can be used by community leaders as tools to help organize such leadership and strategy-building. Who are the potential leaders in communities like those that exist in District 9? And how can they help? The business community can help in so many ways. And this isn't just about helping kids. Business is about expanding markets on some level, right? The money that is sitting in that red box around the Loop in the map above can go toward funding programs that help educate future employees, and put money into the pockets of local consumers with banking needs. A philanthropic check cut in the amount of $50,000 to $100,000 is a token of goodwill and a tax write-off for many of these companies. There are ways businesses can help without cutting checks. Businesses can promote the programs and encourage employees to fill needed volunteer roles with their special talents... skills you might take for granted, like book keeping or graphic design (or even map-making) that can be a god-send for non profits. But business and industry aren't the only ones who can help. In between the skyscrapers of the Loop and the severe poverty of North Lawndale, condos and offices push west into the steadily gentrifying Near West Side, and approach the pockets of low poverty around the district's universities and hospitals. Similar to the Hyde Park neighborhood on the South Side, District 9 has a wealth of hospital and university resources. University of Illinois-Chicago and Rush University are here with their affiliated hospitals. I've already discussed at length in a previous post the role Mt. Sinai Hospital can play in District 9's North Lawndale neighborhood. The bottom line is that hospital leaders at Stroger, Bethany, Mt. 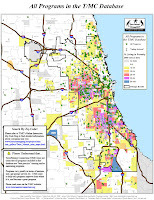 Sinai or any of the nine hospitals in this district, can work with Representative Turner, perhaps using Tutor/Mentor Institute strategies as a starting point, to increase support for new and existing programs - and ultimately improve the overall health of the entire West Side of Chicago. I refer you to additional discussions on strategies and roles Universities and Hospitals can play in the improvement of non-school tutoring and mentoring, if this is your particular area of expertise. We can't forget the role churches and other places of worship can play in the lives of a community's residents, as well as in developing support for tutoring and mentoring. The locations of churches or mosques in Distric 9 provide ideal hosting sites for new programs, as well as places where sermons can tie scripture to service, while pointing members to existing tutor/mentor programs. And if faith leaders at the locations above can commit to social justice through tutoring and mentoring, imagine what all the Baptist church locations in District 9 could do if they worked together to connect the rich people in the Loop and Near West Side with the poor people in Lawndale? ... and where community assets, such as businesses, churches, colleges, etc. can collaborate to draw attention to poverty, and create long-term strategies that support students through tutoring and mentoring and ultimately help everyone in the community by improving the prospects for our children, our economy, and our democracy.